Google Analytics is going to be key to your SEO success, but it can sometimes seem a bit overwhelming, especially if you’re new to the tool. There are many different reports you can run that will then generate a lot of data about your website, and Google Analytics only continues to grow and add more advanced features. Fortunately, if SEO is your main focus, there are several different reports that can help you succeed, but only 3 major reports that are crucial for you to understand and start with—SEO land pages, SEO geographical summary, and SEO queries report. Impressions. The number of times any URL from your website showed up in search results, not including paid AdWords search impressions. Clicks. The number of clicks on your website’s URL from a Google SERP, not including clicks on paid AdWords results. Average Position. The average ranking of your URLs for queries. For example, if your site’s URL ranked at position 3 for one query and position 7 for another, your average position would be 5. It’s important to also realize that you need to connect your Google Webmaster Tools account to your Google Analytics in order to get access to these reports. You can do this by acting as if you are going to find these reports. Click Acquisition and then click Search Engine Optimization and then Queries (or any of the three major reports you’d like). You will be prompted to connect data sharing, so simply follow the quick directions and you’re set. You can also visit this article for step-by-step instructions if you’d prefer. 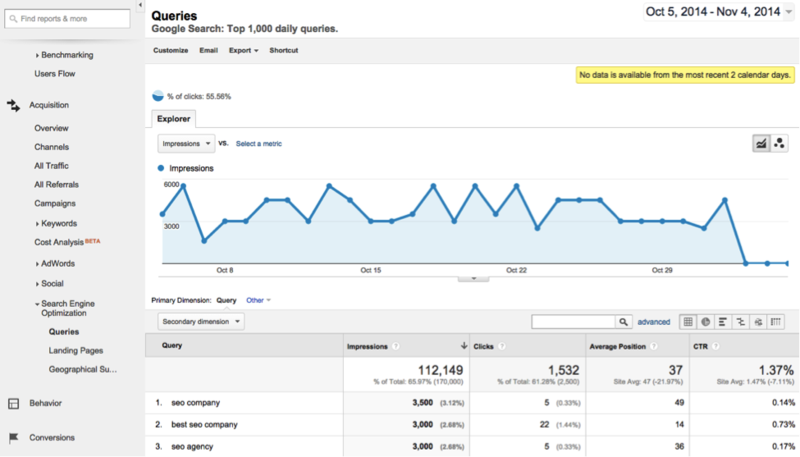 This first report is probably the most interesting report for Webmasters. This will show you the search queries that brought the most impressions for each of your URLs, all of the keywords that you rank for and your average ranking position, and then of course your CTR. The report will be sorted by impressions automatically, so if you’d like to sort the metrics differently simply choose a different column. How to use the report for SEO: Withthis report you should be looking for the pages where your pages might have a great average position, or you’re getting a lot of visibility, but the CTR might be low. Something like quality content could make the difference if you notice this for certain pages. In general, a CTR of at least 20 percent on keywords that are getting a lot of impressions is ideal. Note: The data you will see for all of these reports has about a two-day delay. If you have a new website or you want results for one specific day, you’ll have to wait two days. The SEO Landing Pages Report. This report will show you the URLs to your website that have generated the most impressions in a search. You are also able to see which landing pages are getting the most clicks, and the average position column will tell you if maybe those pages need a boost. In other words, they are pages that people clearly click on and want to see, you just may need to make them more visible if they have a high average position (remember, lower is better). This report will take into account all of your keywords as opposed to just individual keywords (like in the queries report), so you can expect CTR numbers to be much lower. How to use the report for SEO: As discussed above, what you’re looking for here are your URLs that have a high number of impressions and a low CTR. This means that you should be focusing on these pages and optimizing them as much as possible to give them more visibility. All that this means is you should be aware that this is occurring and then cross-reference it with the queries report. Typically your most popular keywords will be driving traffic to your most popular landing pages. The SEO Geographical Summary Report. This report is probably the most straightforward, but a good one to start with nonetheless. Here you will see a general view of impressions, clicks, and CTR based on country. This will help show you which parts of the world are bringing in the most search activity for your website. How to use the report for SEO: This may matter for SEO if you see a trend. If all of your visitors are from one country, then target that country with your advertising and your content. Again, it’s all about understanding your audience when it comes to SEO, so although this report might not seem quite as significant, the results could noticeably alter your strategy. Once again, there are quite a few more reports in Google Analytics that can help you jumpstart your SEO. The three reports above are where you should start, and once you master those reports and understand how they work you can move on to the many other options that Google Analytics offers for SEO. Check out Part II of this series tomorrow to learn more. For more information on using this information and creating a spreadsheet to help you analyze the data and stay organized, I recommend checking out this article by SEO industry leader Neil Patel.